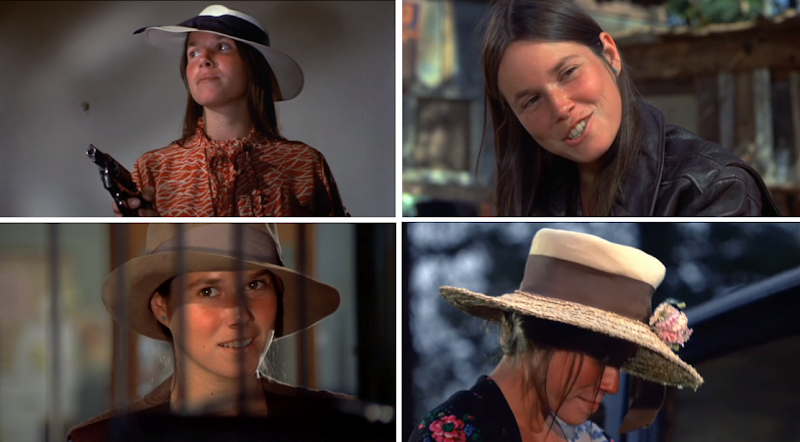 Film stills of Barbara Hershey in Boxcar Bertha (1972) via screenshot. Tomboy Style reader Courtney, originally from the mountains of North Carolina where she says "there's plenty of tomboy style to go around", recommended Boxcar Bertha to me last week. I watched the early 70s Scorsese film last night on a long flight and loved it. Bertha is a rootin' tootin' gamblin' train robbing tomboy, and as Courtney aptly put it, "Bertha Mason is a train robber, so she has to keep stylish yet practical on the go. I imagine her thinking 'If I can't hop a train in it, toss it!" Barbara Hershey has also the loveliest, preppiest tomboy style (men's sweater and toggle coat worn with boots and satchel) in "Hannah & Her Sisters".